Look like a champion, play like champion this season. What does your team stand for? With truly custom OBA team jerseys from Sultan Athletic anything is possible. 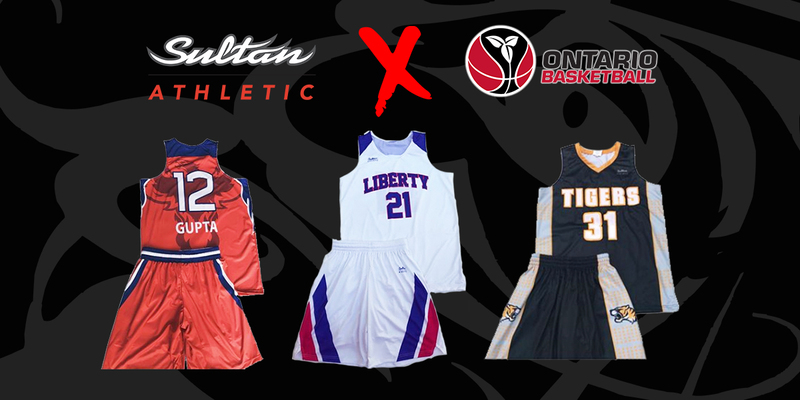 Ontario Basketball is pleased to announce Sultan Athletic as our official custom jersey supplier and encourages OBA clubs to support our partnership. Outfit your team in uniforms that will make your squad stand out and your opponent take notice with a custom, yet affordable, solution tailored to suit your team’s brand. Sultan Athletic’s quality ensures your uniforms are light and breathable to soar through the air, and at the same time tough and durable to battle for the boards. Sultan Athletic is one of the largest custom jersey designers in North America, with design professionals that are experts on logos, emblems, patterns and colours that help throughout the design and delivery process whether you need a refresh or a full rebrand. Sublimated, printed, or stitched – you decide! Also available are single-fabric, two-colour reversible practice jerseys – good for rep and house league teams across an entire club – as well as sublimated basketball bags to complete the look. Support Ontario Basketball’s official custom jersey supplier Sultan Athletic with quality product that makes you look and feel like the pros, and customer service that always go the extra mile.